As baffling as it seems, white noise has proven time and time again to help soothe babies and get them to sleep. There’s even white noise machines you can invest in to help your little one drift off into a deep slumber. It’s one of the only fail-safe methods proven to help reduce crying and improve sleep, but yet there’s some information out there claiming it can actually be harmful to baby’s ears. So what exactly is white noise and can it be harmful to your infant? White noise is basically a combination of different sound frequencies. It’s commonly used to cover up other sounds and is most frequently produced by appliances such as fans, hoovers and radios. The reason it tends to drown out other sounds is because the brain can only pick up on a certain amount of noise. Say a few people are chatting to each other close by. You’d be able to pick out the voices and follow what was being said. However, if there were 1000 people stood chatting close to you, it would be impossible for the brain to listen to all 1000 voices at the same time. White noise is the equivalent of those 1000 voices, making it hard to pick up other noises when it’s on. So think of white noise as a form of background noise, eliminating other sounds. Why Do Babies Like It? It seems illogical that babies would love white noise. After all, you spend most of your time trying to avoid lots of noise around your little one; particularly when you’re trying to get them to sleep. So how could it possibly make them fall into a deep slumber? Well, to understand it, you need to think about where your baby came from. The womb is a surprisingly noisy place. Some experts even compare the loudness of the womb to that of a lawnmower. So, for 9 months, your baby spent their days surrounding by lots of noises. This means when they are introduced into the big wide world, it suddenly becomes very quiet in comparison. White noise reminds your little bundle of joy of time spent in the womb. It’s soothing and familiar, which is why it often works so well at getting them to sleep. White noise machines aren’t always safe for babies. You’d understandably think if a device is marketed towards babies, it’s going to be safe to use. However, a study carried out in 2014 showed many of the white noise machines sold for babies are actually too loud. Within the study, 14 different machines were tested on full loudness in various parts of a room. They were hung from the crib railing, placed on a table next to the crib and placed across the room – all common areas parents were likely to have them. Results of the study showed that every single white noise machine was louder than the recommended 50db. In some machines the volume was reaching more than 85db. Over time this could be extremely harmful to a baby’s ears. The only problem with the study is the fact it didn’t mention which machines were tested. So if you’re wondering whether your machine is too loud, it’s impossible to tell. However, the fact that all of them were louder than they should be highlights it is a wide spread problem with devices available on the market. So what damage could loud white noise do if your baby is exposed to it over long periods of time? Well, permanent hearing damage is the main concern, but it can also impact infant speech. Now, this isn’t to say you should avoid white noise machines altogether. When used correctly, white noise does have a few benefits, most notably, it will help your little one to sleep. 1. Never set the machine to full volume – As the study highlighted, the white noise machines were too loud when set onto full volume. So, the key is to avoid having them on full. Ideally, the amount of noise the machine makes should be no louder than the sound of someone having a shower. So you can test this before leaving the room. 2. Be careful where you place it – Making sure you place the machine as far away from your baby as possible will also help. Never put it directly into their crib and avoid placing it next to the crib too. 3. Run a sound check – If you want to be absolutely sure the machine isn’t too loud, download a decibel checker app. Available on smartphones and tablets, these apps will check the decibel level of the room and tell you exactly how loud the machine is. 4. Turn them down once baby is asleep – When your baby does drift off into a blissful sleep, turn the machine down, or even off. This lowers their exposure to the noise significantly. If you follow the 4 tips above, your baby won’t be harmed by white noise and you’ll be able to benefit from more blissful sleep of your own. If you don’t want to risk using a white noise machine, there are alternatives. Many parents find white noise apps really effective. You can even get free apps if you’re budget conscious. The advantage to apps over white noise machines is that they’re going to be much quieter. However, you may need to make sure your phone or tablet is plugged in to charge as they will drain the battery quite quickly! Alternatively, you could use your own form of white noise such as the sound of the washing machine or tumble drier. If you’re having trouble getting your little one off to sleep, white noise could be the answer! Just be sure if you’re using a machine, it is kept on one of the lower settings. It’s also worth noting that white noise can be stopped as a sleeping aid anywhere from 3-12 months. 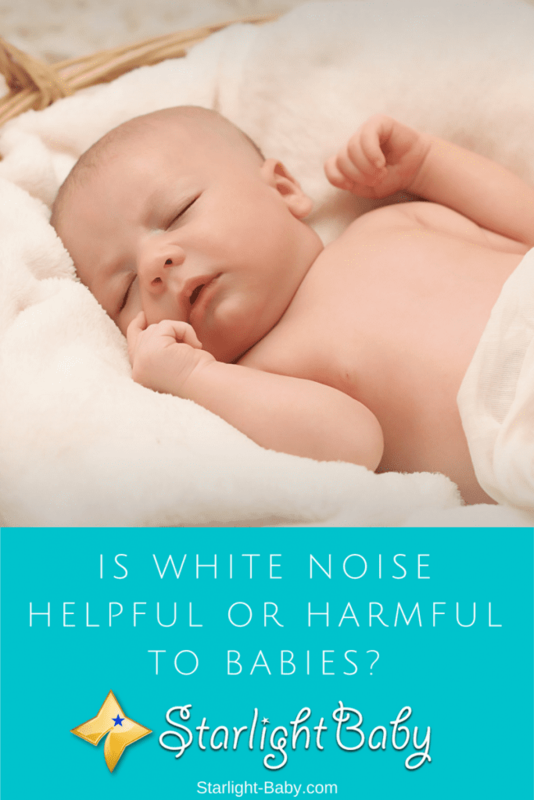 After 6 months, babies don’t typically need white noise to help them sleep and there’s a worry that after 4 months your little one could develop a sleep association, being unable to drift off without white noise. Click here to shop for a white noise machine on Amazon.com! Haha, the womb can sound like a lawnmower? Wow, I never knew that. Is it really that loud in there? I love this article. I honestly never even realized how white noise works and what effect it has on the newborn. I knew from personal experience that it helps them sleep but I never fully understood just why. Thanks to your explanation, now I do. We used white noise with our boy when he was a newborn but we never used the white noise machines. We downloaded one of the white noise apps that you briefly mentioned. I am happy that we didn’t bother buying the machine because it seems much harder to make sure that it’s the right volume and so on compared to the apps. Really, you are making a great article here. Please don’t laugh but I didn’t know anything about the white noise. Now that I am thinking when my son was small, I remember that he was sleeping easier and longer when the radio was on. I will try this method with my next child, I will probably install such a white noise app on my tablet….Thanks!